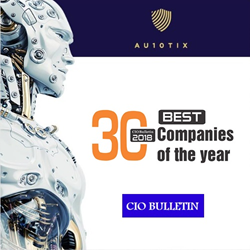 AU10TIX has been named among CIO Bulletin's "Best Companies of the Year 2018", standing out as the only ID authentication and KYC automation company on the list. CIO Bulletin's "Best 30 Companies of the year" identifies companies which are successful in achieving strategic goals through innovation. CIO Bulletin's "Best 30 Companies of the year" identifies companies which are successful in achieving strategic goals through innovation. CIO Bulletin's, Editor-in-Chief, J.P. Pande has earliest said: "Best 30 Companies of the year 2018 program identifies companies which are successful in achieving strategic goals through innovation. Winning a spot on this list indicates the company has distinguished itself from peers by proving itself more valuable and reliable in terms of service quality, vast customer base, innovation, and market position. (https://www.benzinga.com/pressreleases/18/06/p11908222/cio-bulletin-names-wharfedale-technologies-among-the-best-30-companies )"